8 Ideas for your Outdoor Plants! When it comes to the design of the home, whether it's the interior or the exterior, we need to adapt our style to the architecture and space available to us. One great feature that is both functional and decorative are pot plants. They work in every space and every room. 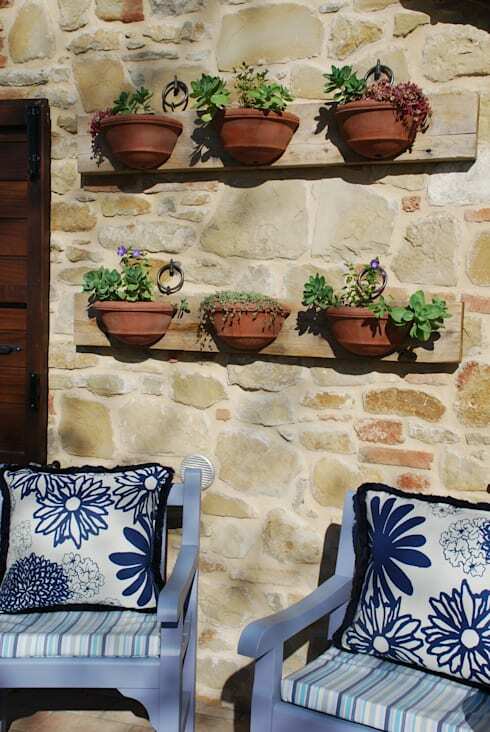 One of the best places that you can place them, however, is on the patio or in the outside space, enhancing the entire exterior of your home. This is why in today's homify ideabook, we are going to focus specifically on the patio and outdoor area and show you how you can really get creative with the plants in your home. While you have probably thought of all of the traditional ways to feature plants throughout your home, we are going to show you eight alternatives that will leave you feeling inspired and excited for your patio and outdoor decor! Our first idea is to use the facade of your home as a way to measure the height and size of the plants and flowers that you use in your exterior space. In this way you can create a completely original design and add a touch of greenery to the exterior ambiance. 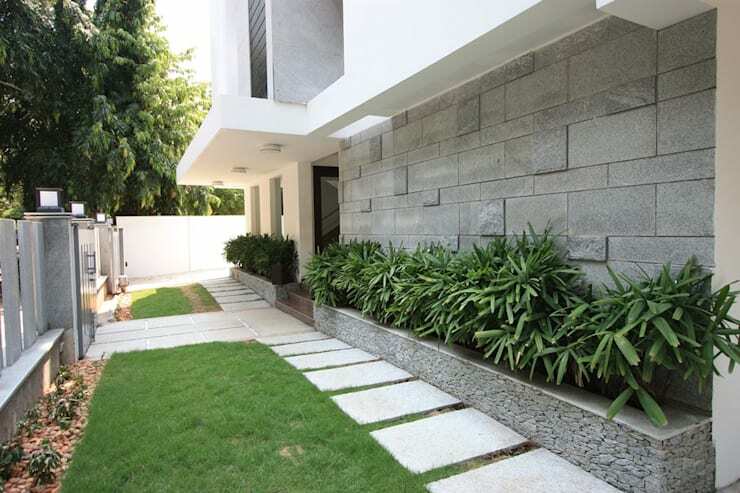 In this design, by Ansari and Associates, you can see how the designers have used the perimetre of the house as a way to measure where the plants should go. With this design, nothing will dull your facade! Select and measure the perfect place for your plants. Another advantage to creating your own little garden patio is that you can really adapt it to your specifications as well as the size of the space available to you. 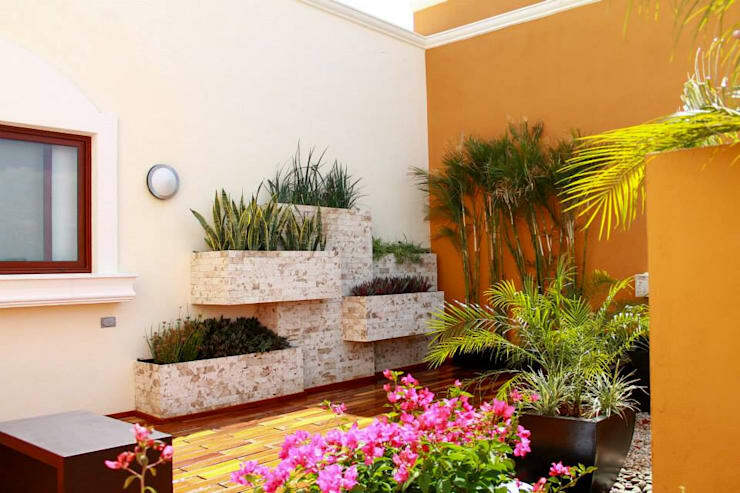 You can also put the plants exactly where you like, choosing the materials and the way you'd like to create your little garden exactly as you like. In this second garden design, we have chosen to show you how by placing different levels and layers on the wall, you can create a truly original, modern and unique garden environment. How dynamic is it? 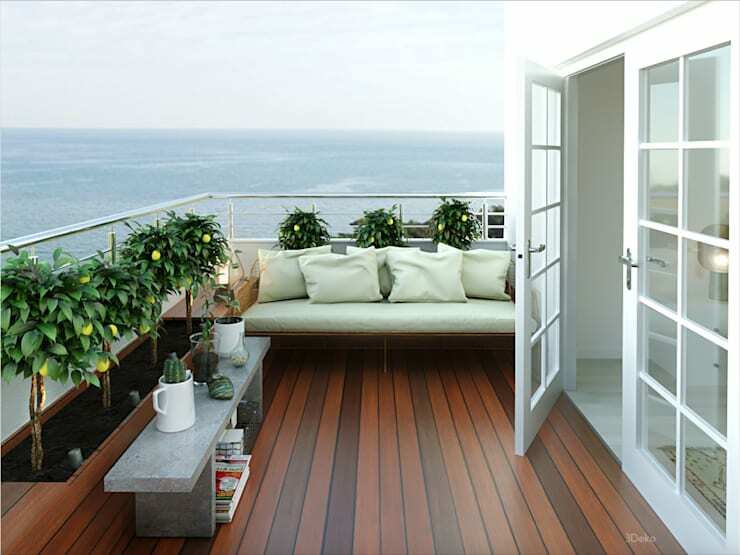 Also have a look at this ideabook on: How to achieve patio perfection. This is a wonderful example of how to really play with the materials available to you. The relationship between the building and the plants is very important and it needs to work in perfect harmony. 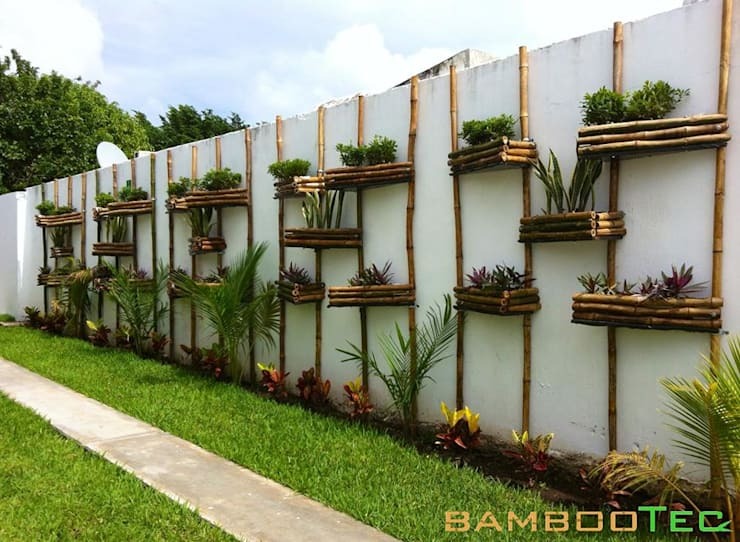 In this example, by Bambootec, we can see how these gorgeous bamboo boxes don't only give height and width to the plants, but also adds a whole new shape and texture to the ambiance. This is why there is no excuse not to let your imagination run completely wild when it comes to creating the garden that you've always wanted. You can do it yourself or you can turn to the professionals. Bamboo is a wonderful material to use if you like this look and feel. 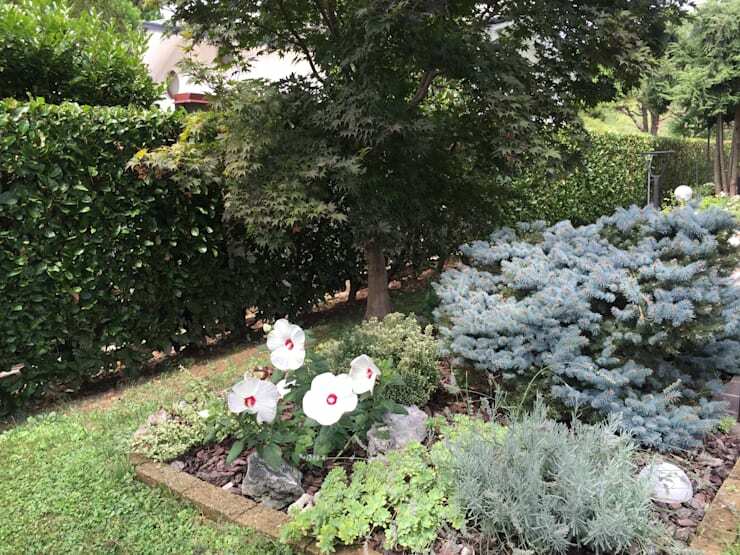 Make the most of the soil in your garden and use up the space that is already available to you to create the most effective and beautiful garden, which will suit any design or plant pattern that you like. If you have a prefabricated home or no garden, then you can always create little boxes of soil and place them throughout the exterior of your home. Plant your flowers or plants in these boxes and your home will become one with nature. You'll never have to leave your home to enjoy the beauty of greenery and fresh flowers! 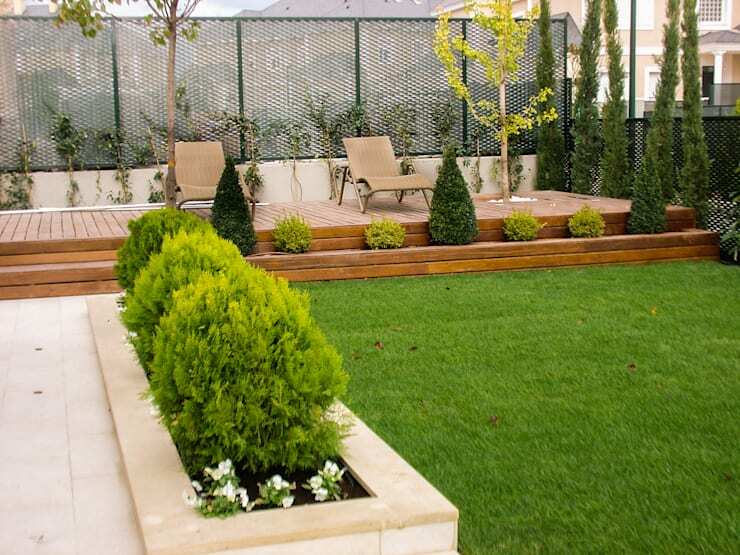 If you do have a garden space where you can plant your flowers, shrubs and trees then design it carefully. You want it to look organised and beautiful as well as suit your needs and desires. 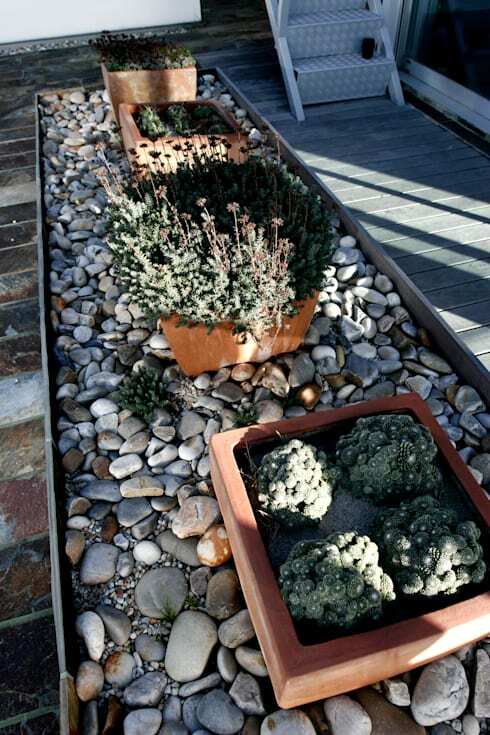 Also have a look at these: Stunning garden ideas for cutting edge homes. Now let's go into a bit of detail about the container plants or boxes of flowers, that we spoke about earlier. Many professionals create beautiful and creative pots that have the ability to hold all sorts of flowers and plant varieties. This gives us the opportunity to really shop around and choose all sorts of colourful or unique pots for our home. The result is a wonderful design! Use height to your advantage, no matter what you do. Use the vertical space to your advantage, creating a garden like this one, which will add a beautiful design element to your patio. They can hang from bars or be installed on the walls, like in this design. This is a perfect way to utilise a wall for decorative purposes. Balconies can be some of the most enjoyable places in a home where you can rest, have a good time, read or even enjoy an afternoon cocktail. The problem is that there is limited space, which means you have to be very careful about the decorative elements that you choose. You don't want to use up more space than necessary and you want to use the decorative elements to enhance the space that is available. This is where plants form a perfect decor element! They allow us to manage the dimensions effectively, while adding natural beauty to the space. This terrace by 3Deko is the perfect example of how plants have been used incredibly effectively. They decorate the space without taking up too much room, allowing for plenty of room for the furniture. This invites you to rest and relax in a beautiful setting. Use your flower or plant boxes for more than one type of plant or flower. They can be a multi-functional element used for many different plant varieties. Not only can they serve as holders for your beautiful plants, they can also serve as a division between different spaces in the garden. This is the best way to organise a garden—with phenomenal plants! What creative things have you done with your exterior space and your plants?